A little ramble about clothes and new pieces for Autumn. At the moment I’m doing something that’s a little unusual for a blogger… working to a budget. I somewhat jest – but in a world where hauls are a regular occurrence in my life there’s very little hauling going on. For the main reason that there’s a whole loaf of house stuff on the to-do list and you know what, turns out house things are expensive. Which means hauls of the non-house things are basically off limits… well, apart from one little treat I ordered from Boden. So, on the other side of the saving/house stuff coin, there’s also me wanting to stop buying too much in the way of ‘fast fashion’ and spend a little more on quality pieces. Moving more towards a signature style and key wardrobe pieces. Generally trying to smarten up my style a little – which is a combination of when I do buy new things, buying quality and also taking more care over the items I have. Ironing them properly, dry cleaning where needed and all that sort of adult type things that I’ve been guilty of skipping in the past. 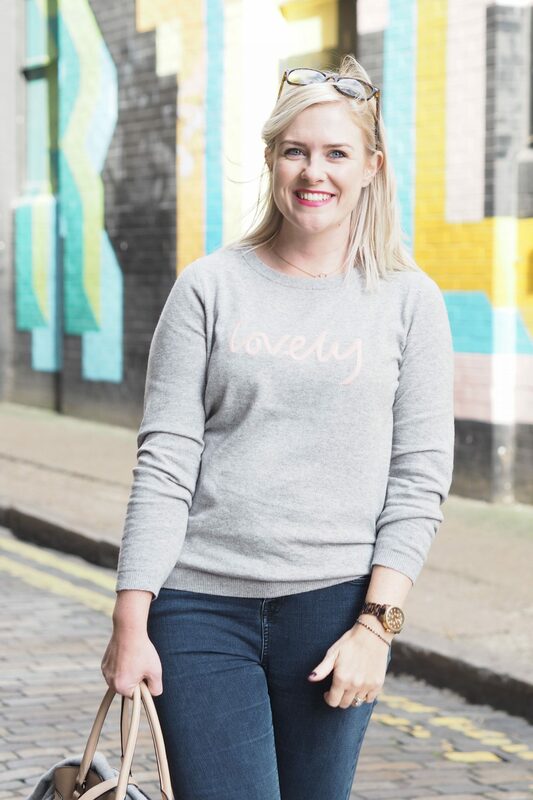 So the one and only addition to my wardrobe so far this season has been a jumper from Boden – a brand that’s fast becoming one of my go-t0 for items that are fun, good quality but still classic. It was in the sale – which meant I was obsessed….and my size wasn’t in stock. Then I got lucky and it came back in. So I snapped it up before there was a chance I’d miss it again. 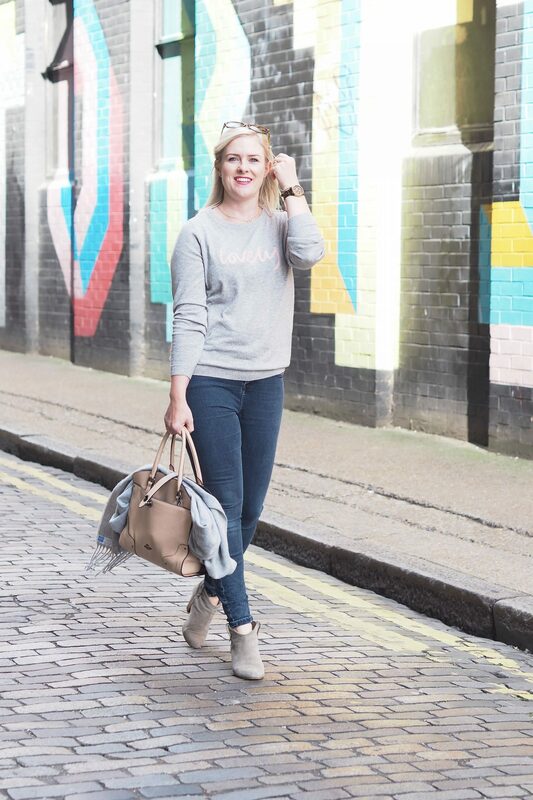 So I added it to my wardrobe as a new staple – a quality grey jumper (with a little ‘lovely twist’), to combine with my other staples of ripped jeans (FYI – Topshop Lucas that have potentially replaced the Jamie style as my favourite) and converse or skinnies and ankle boots. Or inter-changable variations of those. That’s the goal – a wardrobe that works easily without combination dilemmas. The other item in the photos has become a staple in my wardrobe since the Summer too. A Coach bag I picked up from one of my favourite places to shop in New York – Macy’s. A whole block of shopping goodness, which I scoured for hours and eventually took the plunge and chose this cream and black Coach handbag*. This is what I refer to as my ‘work’ bag. One that fits my laptop and all the other ‘mobile’ office bits I need when hopping around London for various freelance work I do. It’s the perfect size and has lots of compartments for all the bits I need to carry. I might do an in-depth post on this if anyone is interested? So there we have it! A ramble about clothes, updating my wardrobe and a lack of haulage going on. Thank you – it’s a ‘lovely’ jumper indeed 🙂 cosy but not too chunky!